Sadly, summer seems to be going by quickly, and I’m determined to make my summer wardrobe work through mid-September. 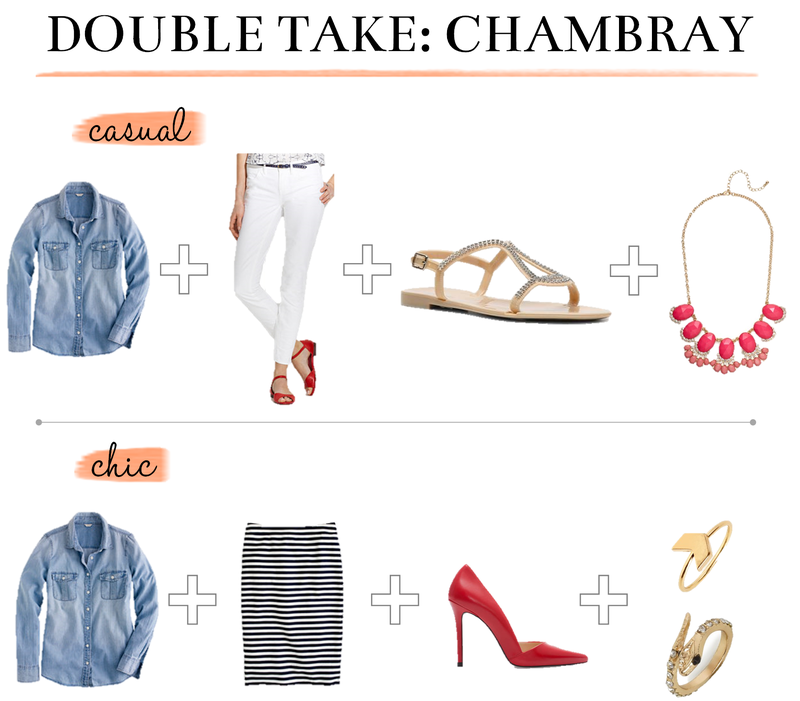 Enter the chambray shirt: the über-comfortable, wear anywhere with anything piece that we all have – not to mention the ultimate transition piece (I really do wear mine year-round). It’s already a bit chilly here on the East Coast, so I’m expecting my favorite shirt to pop up in a lot of upcoming outfits. Here, I’ve styled it two different ways that are summery, but have you covered if there’s a nip in the air. For the casual look, I paired it with white jeans (the quintessential summer staple), a bright statement necklace, and simple embellished sandals for an easy but polished outfit. For the chic look, I treated the chambray top like a classic button-down, and paired it with a fun-meets-serious pencil skirt, structured red heels for a pop of color, and some delicate gold rings. Breaking News: H&M is Online! Perhaps my favorite of all stores is H&M: they offer edgy, high-fashion looks and standby basics (I’m a huge fan of their leggings) at a fantastic price, and the quality is usually pretty decent for the price. One thing, though, that constantly irked me was the fact that my favorite pieces from their website were almost never at my local store, and that I could never access their so-called “Online Exclusives” and drool-worthy designer collabs because they didn’t offer online shopping in the U.S. Well, my friends, that has all changed. Today, as I carried out my daily hm.com visit, I was greeted by an enormous banner announcing that online shopping has arrived! (I might have screamed) Needless to say my shopping bag has filled up at an astonishing rate – here’s a few of my picks from their fall collection.